She’s joined on the track by her stellar bandmates: bassist Bree McKenna, guitarist Eric Randall and drummer Lelah Maupin. The Seattle group expertly meld their contemplative message with a delightfully pop-infused sound, supported by producer Erik Blood (a fellow Pacific Northwestern artist and producer on their last album Lost Time). It’s a fitting expansion on the record’s lead single, “Grains of Salt,” which was more focused on embracing your own identity and staying true to yourself (yes, very after-school special, but Tacocat manage to keep it from being saccharine). Thematically, “Hologram” branches out beyond the self to examine our place in not just our current power structure, but in the universe itself. Nokes ruminates on the tenuous nature of reality before asking, “How small are you?” It’s not a question meant to scare, but instead remind us how reassuring it is to be a tiny part of something large, wonderful and utterly baffling at times. 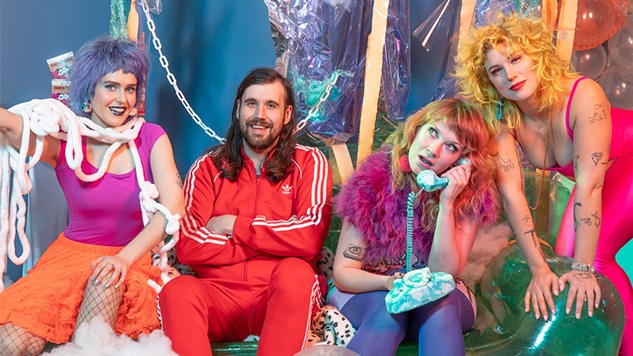 Listen to “Hologram” below and explore Tacocat’s forthcoming tour dates here. You can preorder This Mess Is a Place, out May 3 via Sub Pop, here.